You’ve undoubtedly seen their remarkable orange, black, and white patterned-wings fluttering before, but this fall, you’ll have a chance to witness Monarch butterflies gathered in droves here in Western North Carolina as they migrate south for the winter. The 2,500-mile journey to Mexico’s warmer climate can leave landscapes covered in their beautiful orange hue, and lucky for us, their route takes them right through the Smoky Mountains. Monarchs often travel along mountain ridges, so our mountain towns are one of the best places to see them. Catch one of Mother Nature’s best displays between September and early October in one of the locations below. These are also some great spots to view the fall foliage! Wagon Road Gap: Parking area at Milepost 412.2. Double Top Mountain Overlook: Milepost 435.3 at Balsam Gap near the junction of Route 215, parking area located on Flat Gap. Cherry Cove Overlook: Near-360-degree views at Milepost 415.7, south of Mt. Pisgah. Pounding Mill Parking Overlook: 20 miles south of Canton at Milepost 413.2. Waterrock Knob: With plenty of parking and one of the most iconic views on the parkway, this is another exceptional viewing area in Haywood County. Located at Milepost 451.2, this 360-degree overlook also offers a summit hike. Their Visitor Center will be open from 10 am – 5 pm through October. Black Balsam Knob: Work for your view and hike to the Black Balsam summit via the Art Loeb trail to catch a glimpse of the migration! Parking (located at Milepost 420.2) may be hard to come by. Haywood-Jackson Overlook: The overlook itself may only offer a few glimpses of mountain peaks due to the dense firs that tend to block the view. For a real treat, take a hike up to Richland Balsam, the highest peak on the Blue Ridge Parkway, for a glimpse of the monarch migration. Located just north of Haywood County, this wildly-popular camping destination boasts a beautiful 360-degree view on a cleared mountain top. (It’s also a perfect picnic spot, so think about grabbing a picnic lunch from Sunburst Market in Waynesville before you go!) It’s roughly a half mile hike from the parking lot to the summit. On September 16, take a short trip from Haywood County to the Cradle of Forestry, where they’re hosting their second annual “Bring Back the Monarchs” event. 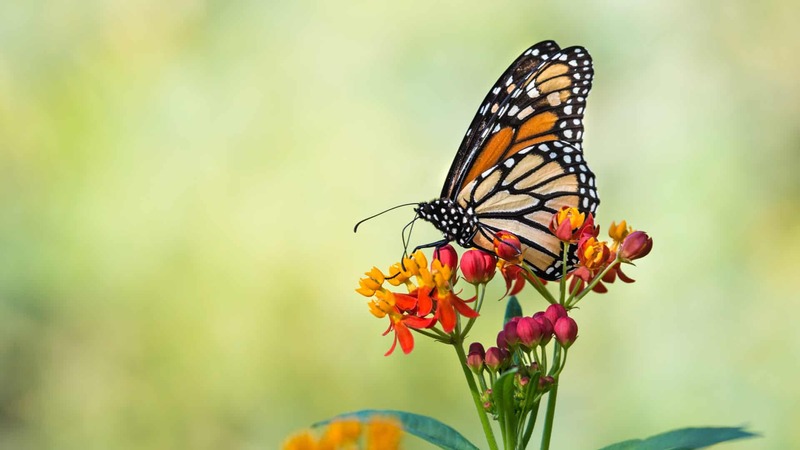 Due to the destruction of the milkweed plant, the Monarch population is 90% lower now than it was 25 years ago, and the Cradle of Forestry has been working to replant this crucial food source. Visiting the site is a great opportunity to not only spot some butterflies, but to also learn more about preservation efforts in place to protect the Monarch population. Head to the Arboretum as they host their second annual Monarch Butterfly Day on September 8, 2018. Activities to do on this day include Monarch tag and release, milkweeds for sale, and more. Finding the monarchs is part luck and part science, but checking out these spots will increase your chances of seeing the migration. While you’re here, find other ways to enjoy the fall weather in the Smokies. And if you’re able to spot some Monarchs, make sure you share them with us on social using #HAYNOW!